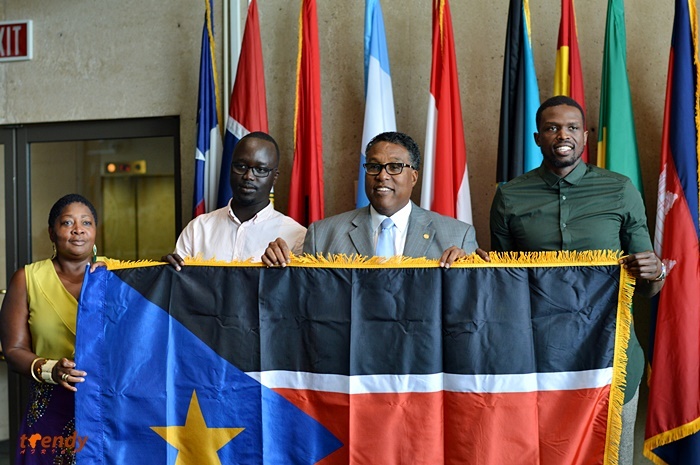 History was made today July 24th, 2017 at the City of Dallas flag room during the official presentation and dedication of the South Sudan flag by NBA star Luol Deng. 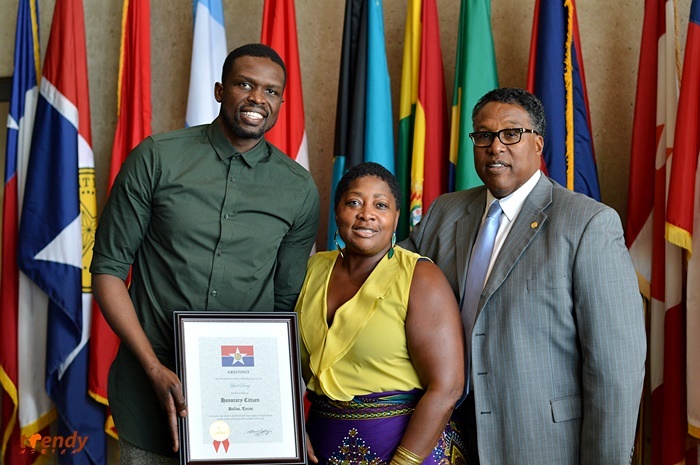 The event brought together top City of Dallas officials including Honorable Mayor ProTem Dwaine R. Caraway who officially welcomed Luol Deng to the City and also presented him with a honorary citizenship of the city of Dallas. With reference of his numerous philanthropic gestures, Deng also received a special recognition from the office of Congresswoman Eddie Bernice Johnson represented by Dr. K.L. Newhouse. Deng also received commendations from Ms. Elsa Juko-McDowell – President East Africa Chamber of Commerce, Mr. Anderson Obiagwu – Founder AFRIMMA, Cory J. Feinberg – Moneygram, Mr. Larry Mallory – President DFW chapter NFLPA former players and also representing the DFW Business and sports community and the Honorable Dr. Hyacinthe Ndri, Honorary Consul of Ivory Coast. 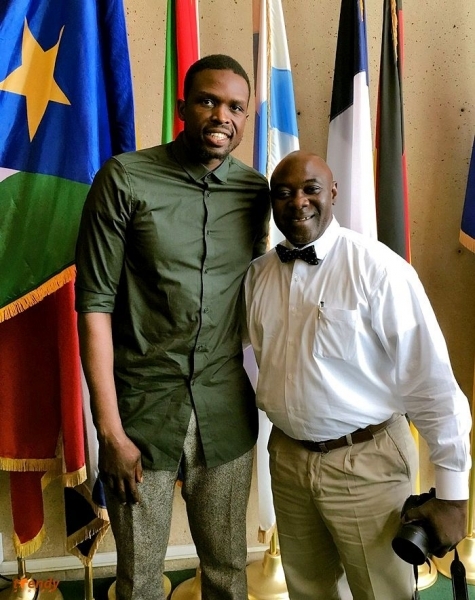 In her remarks, the Africa Liaison officer for the City of Dallas Ms. Regina Hill Onyeibe expressed her gratitude to Luol Deng for honoring the invitation to the City and also acknowledged his efforts at meeting the needs of his community and channeling his resources to charitable ventures. 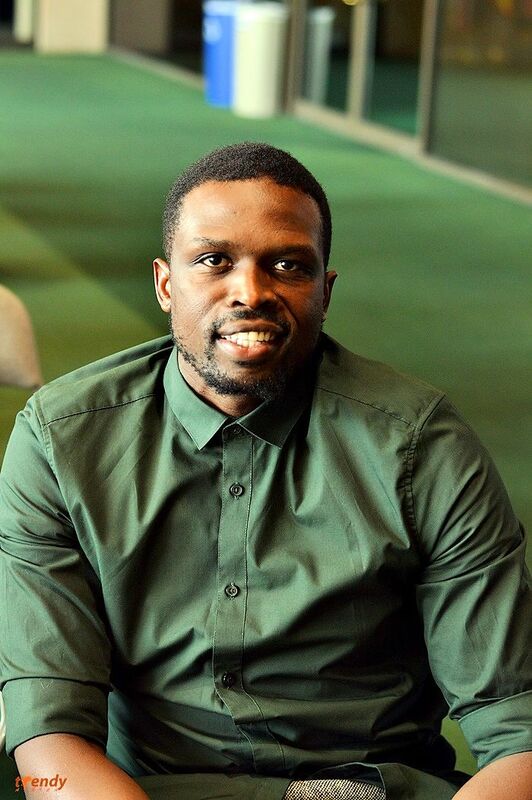 Luol Deng was born in Wau, South Sudan and belongs to the Dinka ethnic group. During his early years, his father Aldo was a member of the Sudanese parliament and had to move the family to Egypt to escape the second Sudanese Civil war. In Egypt, they met former NBA center, Manute Bol, another member of the Dinka tribe, who taught Luol Deng’s older brother, Ajou Deng, how to play basketball while also serving as a mentor for Luol himself. When his family was granted political asylum, they emigrated to Brixton, South London. Deng’s college career was with Duke University. He has had a decorated career in the NBA, starting his professional career with the Chicago Bulls, he then moved to the Cleveland Cavaliers, then to Miami Heat and has been with the Los Angeles Lakers since 2016.